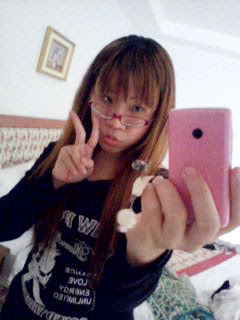 I'm back at Bangkok now. 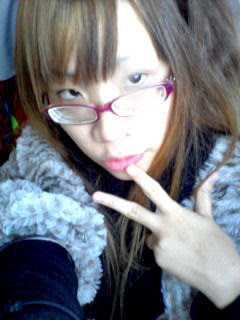 Actually,I've arrived here since the 5th but too tired to update my blog. 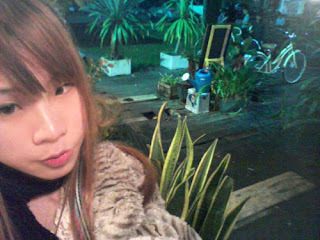 Chiang Mai wasn't as cold as I thought but it's not so bad,still cooler than Bkk. 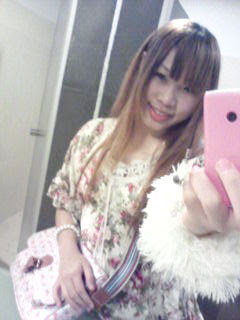 Sadly,I didn't take many pics as I expect coz my already took most pic of the place we visited and put on her facebook. ost some of the pics with me in them. I'll upload just day 1 and 2 first since there're too many pics,I don't wanna bother uploading them all at once. Day 1,it's me,taken this pic on the tour bus. At the hotel we stayed. 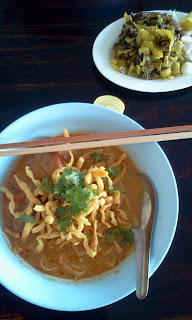 Breakfast,a local dish called "Kao Soi". 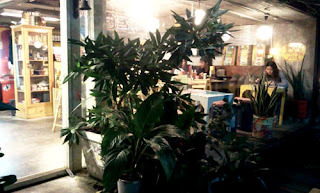 Dinner at Little Cook,This is how the restaurant looks like. From my view inside the restaurant. 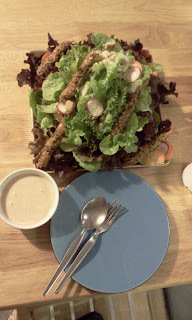 I order fried-shrimp salad...it's just too much for a 100 baht dish!! We also met Khun Tan,a famous businessman with his friend,a famous camedian,Note "Udom" Taepanich at his shop!! I was his fan tho,I didn't ask him to take pic with me since he looked kidda busy. 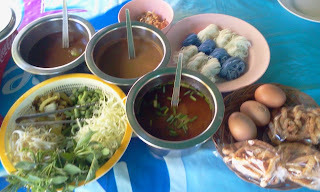 Day 2's breakfast,another local dish called "Kanom-Jeen"
It's me at Wat SuanDok. 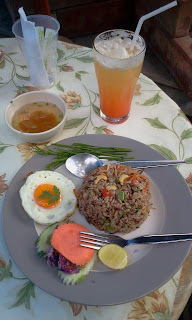 Lunch at Pun Pun,vegetarian restaurant.I ordered fried rice and punch. 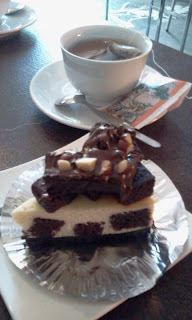 Tea break at Impresso,Nimmanhemin Soi 13.Brownie cheese cake with eucalyptus tea. 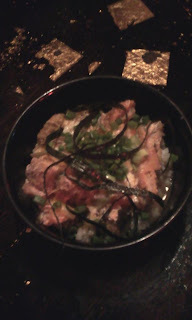 Dinner at Hatena,Chiang Mai.It's Katsudon. Day 2,we plan to go to some temple around there and end up at Wat Suandok coz we saw in the guide book that there's a vegetarian restaurant there. Never mind,I gotta get used to this somehow. We took the pics around the temple and had lunch there. The restaurant was a bit hard to find since it's hiding in to back corner. But it's worth finding,it looked popular among Westerners since we saw them a lot there. 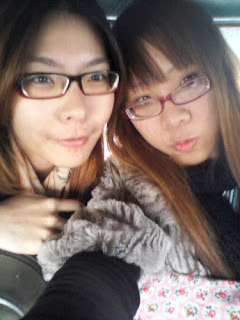 After that we went back to Nimman Rd. 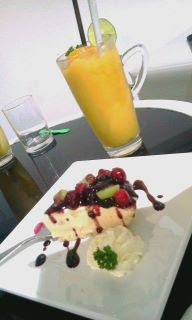 and had a tea break there. My friend was waiting for dinner at Hatena coz she knows the owner...or I should say ex.owner? We met P'Jung there and learned that he has sold Hatena while he wasn't in Chiang Mai. He was at the restuarant next to Hatena tho,I think it's his friend's or something. He did joke about me for being so quite and hard to approach tho. 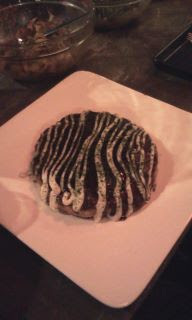 But the Okonomiyaki he made was very delicious anyway. I guess I'll end this entry for now. Next entry I'll write about more ppl that came to join our trip.